Guardians of the Galaxy 3: Will Director James Gunn Return? 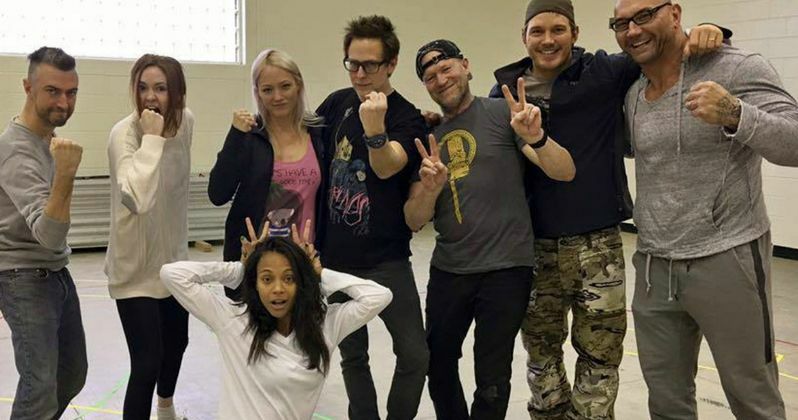 Director James Gunn often uses his social media accounts to connect with fans even while he's deep in production, like he is now with Guardians of the Galaxy Vol. 2. Shooting started on the sequel last month in Atlanta, Georgia, and while taking a break in his trailer today, the filmmaker decided to host a live video Q&A session through his Facebook page. The filmmaker revealed an interesting tidbit, hinting that he may or may not return for Guardians of the Galaxy 3. "Right now I really am just concerned with doing Guardians of the Galaxy Vol. 2. I'm not sure what I'm going to do after this... Marvel has talked to me about continuing on. I'm not sure if that's what I want to do or if that's not what I want to do. I really just want to make Guardians of the Galaxy Vol. 2 the greatest possible movie that I can, and something that's as honest and sincere and true as it can possibly be." Back in November 2014, James Gunn teased he already had story ideas in mind for Guardians of the Galaxy 3, although he wouldn't divulge any specifics. Of course, we likely won't hear anything official about Guardians of the Galaxy 3 until Guardians of the Galaxy Vol. 2 hits theaters next May. But if it's as big of a hit as its predecessor, Guardians of the Galaxy 3 will surely move forward. Still, we have a long way until that sequel moves forward. Production is still on-going in Atlanta, though it looked like the sequel might have to leave the city. Last week, Disney threatened to pull all future productions out of Georgia after the state legislature passed a discriminatory new bill. Nathan Deal vetoed the bill, bringing an end to the possible boycott. If signed into law by the state's governor, House Bill 757 would have permitted faith-based groups and organizations in the state to discriminate based on sexuality. While Disney was the first studio to speak out against the bill, several others followed, including Fox, Time Warner, Netflix, AMC, Lionsgate and others. Guardians of the Galaxy Vol. 2 has been given a May 5, 2017 release date, which doesn't have any direct competition at this time. If Marvel does move forward with Guardians of the Galaxy 3, do you think James Gunn should direct the superhero sequel, or would you like to see another filmmaker take a crack at the Guardians? Chime in with your thoughts and stay tuned for more on Guardians of the Galaxy Vol. 2 as production continues in Atlanta. You can also visit James Gunn's Facebook page to watch the entire video Q&A from earlier today.